IT Six Global Services is a Romanian software company headquartered in Craiova whose main activity is the development of creative solutions and services for the global market. We currently employ over 130 people, helping us deliver projects to clients in 14 countries on 4 continents. 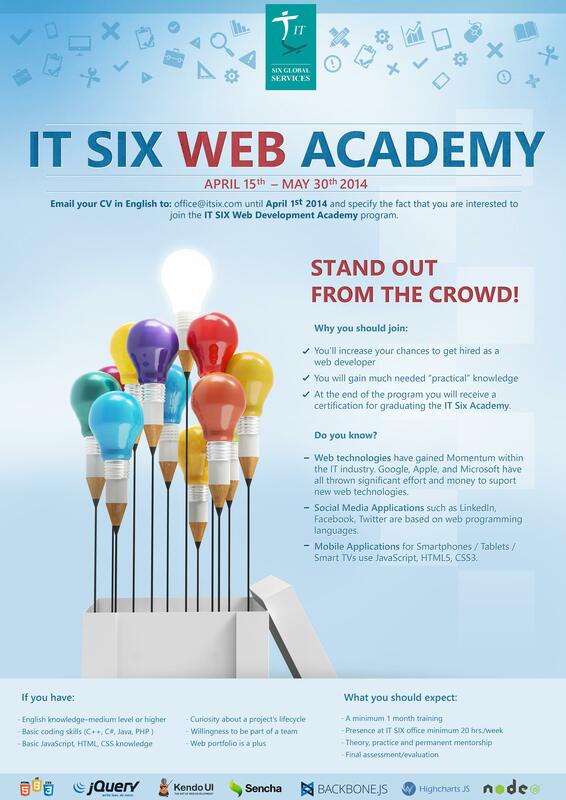 Another student training program offered by IT Six is about to start: Stand out from the crowd and choose a career in Web Development! The IT Six Academy’s mission is to complete the knowledge built during University classes with more advanced concepts, best practices and personal abilities required in the global software market. The purpose of the program is to help students develop practical and teamwork skills to meet the standards of real projects and real deadlines. As in every IT Six Academy program, we will discuss about software engineering principles first. The program will run with a minimum training period of 45 days. The presence at the IT Six headquarters in Craiova, will be minimum 20 hours per week. You will have the chance to work with professionals and follow a full project cycle. Email your CV in English to: office AT itsix DOT com and specify the fact that you are interested to join the IT Six WEB Academy program.